City: Melody Heights Subd., Muzon, San Jose Del Monte, Bulacan. One is located at Melody Heights Subd., Muzon, San Jose Del Monte, Bulacan. Lot area = 115 sqm. Total floor area = 435 sqm. 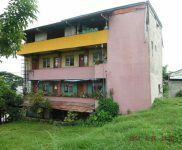 It is a 3 storey bldg w/ covered roof top. It used to be a school bldg. TCT no. 040-2014013866 Selling price is Php3 million negotiable.